Making water accessible to those living in dry areas of the world has always been a difficult task. In order to overcome this challenge the option of harvesting water from air has been considered, but the technology to make this possible consumes a lot of energy. Scientists have established the fact that a new device would be capable of harvesting high-quality water at low energy consumption levels. The results of the research have been published in the journal Environmental Science & Technology of ACS. A study conducted by the International Organization for Dew Utilization and reported in 2000, states that the amount of water vapor contained in the air around us is equal to the amount of underground and surface level fresh water available on earth. But, there are a lot of disadvantages in the machines that are capable of collecting the water available in the atmosphere. For instance, the method that reduces the air temperature through electrical refrigeration and condenses the water vapor, takes up 40% - 90% of the device’s energy requirements. Technion scientists, in Israel, have compared their new technique to this method. 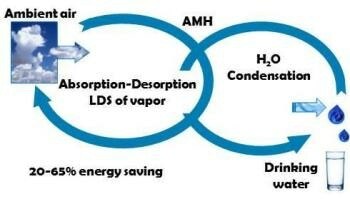 The method devised by Technion scientists involves the use of liquid desiccant to extract the vapor from air and then cool the vapor alone. According to their evaluation, using their technique can lead to 20% - 65% saving of energy, as compared to the traditional method. The level of energy saved would depend on factors such as climatic conditions of the site and the technology used.